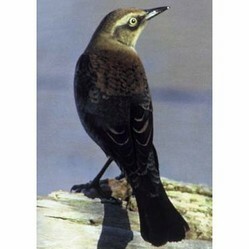 The Rusty Blackbird, Euphagus carolinus, is a species of blackbird native to North America. Once abundant, this species' population has plummeted in recent years. This page gives an overview of this bird species, its identification, range, and habitat, and explores what is known about its decline. It concludes with things that you can do to help protect this species. Rusty color on all but breeding male plumages, and distinctive shape make this bird easy to ID. As a new world blackbird, the Rusty blackbird is a close relative of the Common Grackle, Red-winged Blackbird, and Brown-headed cowbirds, and has a structure similar to these birds. Identifying it is usually done in comparison to its other close relatives. The Rusty blackbird is more distinctive in some plumages than others. The male in breeding plumage is black overall, with a pale yellow eye, and is best identified from other all-dark, yellow-eyed blackbirds (such as the common grackle) by size and shape. In winter, the male has significant "rusty" color on it. The female, in non-breeding plumage, is brownest of all, especially on the back and crown. Most blackbirds are easy to tell apart from the rusty blackbird. The trickiest to tell apart are the Brewer's blackbird: Brewer's blackbirds have a very similar build and structure, and female and juvenile birds of this species have a similar brown coloration. The two different in habitat: Brewer's blackbird frequents grass, whereas the Rusty blackbird favors swamps, especially those in or near forests. Cornell Lab of Ornithology has excellent ID tips for the rusty blackbird on their site All About Birds. At this time of year, the female would be browner. In breeding season (spring/summer) this bird would be darker. Have you ever seen a Rusty Blackbird? Have you ever been able to see a bird and identify it as a Rusty blackbird? Yes, and I identified it as a Rusty blackbird. No; if I have seen one, I haven't been aware of it. No, and I live outside the range of this species. The Rusty blackbird is a bird of wet areas, especially forests with standing water, and swamps, marshes, and swampy pond edges. These are the areas which this bird favors during winter and migration. The red-winged blackbird also likes wetlands, but this species prefers more forested areas, especially areas with leaf litter in shallow water, rather than grassland and wetlands with dense grass and dense vegetation that the red-winged blackbird likes. In the summer, the breeding season for this bird, it seeks out bogs, beaver ponds, and wet parts of boreal forests. Where it is abundant, it can be found on drier ground, but now that it has become scarce, it is usually quite rare except outside of the wet habitats that it is best adapted to. The Rusty blackbird breeds coast-to-coast across Canada and Alaska, migrates through the midwest and northeast, and winters in the Southeastern U.S. The breeding range of this species extends across Canada, from the Atlantic Ocean the whole way to the Pacific coast of Alaska. It extends quite far north but not into the coldest tundra areas. Although its breeding range stretches to the west coast, this bird heads east in migration, through the midwest and northeastern U.S., and settles to winter exclusively in the southeast, with some birds wintering as far north as Missouri or Connecticut, and as far west as Eastern Texas. Their southern wintering range is limited to northern Florida. Sandy Ridge Reservation in Ohio is ideal Rusty Blackbird habitat during migration. Sandy Ridge Reservation, Ohio: A reliable place to see Rusty blackbirds in migration. Why is this bird's population declining so steeply? Habitat loss, acid rain, and deliberate poisoning of blackbird flocks are possible culprits. The populations of the Rusty blackbird are crashing at an alarming rate. It was once one of the most abundant species in North America, a very common bird. In the past 40 years, its population has plummeted, dropping by somewhere between 85 and 99 percent. Habitat loss may be threatening this species. On the breeding grounds, development for mining and oil and gas extraction, and clearing of forests may be a major factor. The draining of swamps for development or agriculture may also be removing this species' habitat on its migration and wintering grounds. Acid rain may be decreasing the population of invertebrates that depend on calcium, which this species relies on for food. Poisoning of mixed-species blackbird flocks in the southeast may be killing this species. I recommend this book if you are interested in conservation and protection of endangered and threatened bird species in North America. Report rusty blackbirds, support local conservation to protect habitat, and check out the Rusty blackbird working group. There are actually numerous things you can do if you want to help protect this species. Report rusty blackbirds - This species has become quite uncommon, which means it is not frequently reported. If you see one and know how to identify it, submit information on your sighting to eBird and to local birding groups. Support local conservation initiatives - If you live anywhere within this species range, any protected habitat will help. I and other birders have observed this bird using small wetlands in city parks, and I have also seen a big flock of these birds using a larger wetland nature preserve in Ohio during its migration. This bird particularly depends on wet or swampy forests, or swamps adjacent to forests--although these aren't the most pleasant or accessible habitats for humans, it is critical to preserve them to protect this and other species that depend on these habitats. Get involved in the Rusty blackbird working group - If you are a researcher or have serious resources to dedicate to this problem, I recommend getting in touch with the Rusty blackbird working group. This is the group where the core of the action is happening to understand the decline of this species. Even if you're not able to help this group, they are publishing a lot of studies on the topic, and their site is the main place to get current updates on research and conservation efforts for this species. Conserve energy - Conserving energy helps solve so many environmental problems, and this species is also protected by energy conservation. Acid rain and mercury contamination, which are driven largely by coal-fired plants for electricity production are two potential causes of this species decline, so by using less electricity yourself, you will also be helping to protect this species. If you live in an area with electric choice, make sure to buy your electricity from a provider of renewable energy like wind and solar. Stop the poisoning of blackbirds - If you live in an area that poisons blackbirds, like rural areas in the Southeast, speak with farmers and with your government, such as the U.S. and State agricultural departments, and urge them to stop this practice. Use of American Holly tree in gardening and landscaping; growing requirements, size, and advantages over non-native hollies when grown in or near its native range. Yeah...when I travelled through the American West, I became aware of how few wetlands there are out there! I checked eBird, and Rusty blackbirds do visit Colorado in winter, but only in the far eastern part of the state, and they're uncommon there. Much more common in Colorado is the closely-related western species, Brewer's Blackbird. The two are hard to tell apart without knowledge and a close view. Brewer's blackbirds are found through the whole state, and I think are more common in the west. This bird is not endangered--and it seems to do better around humans than the Rusty Blackbird, so if you see something that looks like this in Colorado, chances are you're probably looking at a Brewer's blackbird. Very interesting, I'm just a beginning to bird. I live in Colorado where there are not a lot of swamps but we do have some protected wetlands. I'll keep my eyes peeled. Thank you! I lived briefly in SoCal and became familiar with the Brewer's blackbird, which is the closest relative of the Rusty Blackbird that is native there. Populations of the Brewer's blackbirds though are much more stable, probably because they're adapted to open areas, and thus are more comfortable living around humans. It is out of my range in SoCal but I am interested in all bird info and This article was very informative. cazort, Me, too, I'm concerned about rusty blackbirds. I've written about them on other sites, and a while ago I wrote an article which is in my Wizzley to-be-published queue, awaiting its turn in the lineup. So I'm happy to see rusty blackbirds in the spotlight via your article, with good suggestions for involvement from concerned citizens. Thank you! I know what you mean about articles that cover problems without talking much about solutions. I want to keep my articles empowering, and give people concrete things they can do to make a positive difference! I consider myself a beginning level Birder. I mainly got interested because I like to take photos of them, but have to admit I get a little deeper each year. I knew very little of this species before today. Thanks for the "How can you help" section. Too often you read articles covering various problems, with not enough offers of real solutions. If each person tried to do a little, together we could all do a lot. I'll have to keep my eye out for Rusty Blackbirds during their migration. Now I will keep an eye out for this bird. Great article with lots of useful info. I'm sure this bird would thank you! Yup! Plumage is the right word; you're already talking like an Ornithologist! =) And thank you, KathleenDuffy, I definitely hope this bird recovers too! I think it will if people keep raising awareness of it and studying it the way it has been happening lately. And Ragtimelil, I definitely see far more grackles than Rusty blackbirds...I probably see a few hundred grackles for every 1 rusty blackbird I've spotted. Grackles are much more likely to show up in a parking lot or around a cafe. On the west coast, this bird's closer relative, the Brewer's blackbird, is likely to frequent outdoor cafes and parking lots too. For some reason, the Rusty blackbird doesn't seem to go around human habitation as much.